You’ll find yourself in Professor Slughorn’s living room, here you need to basically tidy the place up for items which will allow you to move on. It doesn’t matter what order you do the following steps in as long as you do them all! Put the record on the record player and destroy the bricks in the window to get another record, place this on the record player too. Destroy the bricks in front of the bookcase and pick up the photo that is left behind. Place the photo on the vanity unit to the far right of the room. Go to the right side of the bookcase, press and hold the A button and use the directional buttons to push the bookcase as far to the left as it will go. You’ll see the 3rd record for the record player. Place this on the record player to get another photo, place the photo on the vanity unit. Use the ‘Wingardium Leviosa (WL)’ spell on the lamp to stand it up and on the bricks in front of the fire-place to make a clock. Destroy the bricks on the floor to reveal a clock cog, put the cog in the clock that you just created. Use the ‘WL’ spell on the pictures above the fire-place to get a second clock cog. Place the cog in the clock and the clock will release a photo for the vanity unit, place the photo on the vanity unit. Use the ‘Reducto’ spell on the bricks in the fire-place then use the ‘WL’ spell on the Lego bricks left behind. Use the ‘WL’ spell on the light fitting pieces to place the fitting on the ceiling; this will reveal another photo. Place the photo on the vanity unit. A blue exit pad will appear in the middle of the room, before exiting do the following for a character token. (Madam Pince Character) – Switch your character to Dumbledore and select the ‘Deluminator’ spell. Press and hold the Y button and target the lamp that you put together by the clock, release the Y button to get the light. Go over to the bookcase and press and hold the Y button, target the light and release the Y button to get the light to light up. A row of studs will appear with the Madam Pince Character token at the end. On the far left of the room you’ll see a doorway with stairs, head up the stairs to find a secret room. Use the ‘Reducto’ spell on the padlock on the cabinet at the top of the stairs to reveal a Hermione Bag Spot. 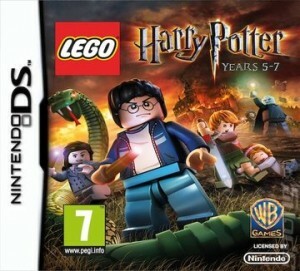 (Wizards Hat) – (Free Play Mode) Switch your character to Hermione and use the Bag Spot to get a plunger. Use the ‘WL’ spell on the plunger by pressing and holding the A button to find a Wizards Hat in the toilet. (Wizards Hat) – (Free Play Mode) Use the ‘Arguamenti’ spell to fill up the bath tub and then use the ‘Reducto’ spell on the shelf above the bath to drop the bubble bath in the water which will make bubbles. Shoot all of the bubbles to reveal a bubble containing a Wizards Hat, shoot the bubble to gain the Wizards Hat. Now continue through the blue exit pad to Weasley Wizard Wheezes. You’ll find yourself in the Weasley Wizards Wheezes shop. The aim in this area is to create a love potion to give to Verity, so that she will let you go upstairs. First round-up the three purple creatures that have escaped from the cage by walking behind them leading them up to the cage; at first this may seem difficult but keep trying and you’ll get the hang of it in the end. Then use the ‘WL’ spell on the cage to put it back on the ceiling. A love potion item will be left behind on the floor. Use the ‘WL’ spell on the key which is located on the floor in front of the duck, to put it in the box on the table. Use the ‘WL’ spell on the key again to release the jack in the box, this will scare the duck and the duck will lay an egg. Shoot the egg to create another love potion item. To the right of the duck is a product display, shoot it to leave a third love potion item. (Leanne (Jacket) Character) – To the far top-right of the room is a green strange-looking girl head holding a barrel. Use the ‘WL’ spell on the head to get the Leanne (Jacket) Character token. Jump on the table that the duck is on and the use the ‘Reducto’ spell on the flying saucer to get it to break up the box to the left of the stairs. Use the ‘WL’ spell on the Lego pieces that are left behind to make a Quibbler Dispenser. Press the A button to collect a pair of ‘Spectrespecs’. Go over to the other side of the stairs and use the ‘WL’ spell on the Lego pieces; do the same to the piece located in front of the table with the duck on it. This will release the cauldron from the flower to the right of the stairs. Now collect the three love potion items that you uncovered earlier and put them into the cauldron to create the love potion. Press the A button to get a box of love potion chocolates and give them to Verity. You will become Verity’s character, so use Verity to open the gate to the stairs, and make your way up the stairs. (Verity Character) – At the top-left of the stairs, you’ll see three coloured piles of magic sand and three coloured boxes. Use the ‘WL’ spell on the three piles to put them into their boxes; this will give you the Verity Character token. (Wizards Hat) – Using the George Weasley character, select the ‘pet’ ability to deploy a ‘Decoy Detonator’, use it to destroy the Weasley Wizards boxes; this will give you a Wizards Hat which is located in the middle of the balcony. (X10 Stud Multiplier Red Brick) – Use the ‘WL’ spell to give sweets to the clown head, use the ‘Reducto’ spell very quickly to break the clowns teeth; this will take a lot of attempts and is very difficult and frustrating so just keep at it and you’ll get there eventually. Then use the ‘WL’ spell on the sweets again to get the clown to give you the 10X Stud Multiplier Red Brick. (Wizards Hat) – (Free Play Mode) Switch to a ‘Dark Magic’ character and use ‘Dark Magic’ on the padlock on the cabinet to get a Wizards Hat. Head down the stairs and exit to Hogwarts via the blue exit platform. Go up to the first table and use the ‘WL’ spell on the cauldron to make a green splat on the floor. Jump on the green splat and use the bookcases to jump over to the ‘draught of living death potion (DLD)’ item. Pick up the item and put it into the cauldron. Go over to the second table and use the ‘WL’ spell on the cauldron to get some Lego pieces, use the ‘WL’ spell on the Lego pieces to create a rain cloud and use the ‘Reducto’ spell on the cloud to gain studs. (Lavender Brown Character) – Use the ‘Lumos’ spell on the Devils Snare vines to get the Lavender Brown Character token. Switch to Harry’s character and use the Parseltougue cabinet to get another ‘DLD’ item and put it in the cauldron. Switch back to Ron’s character and open the Weasley Wizard Wheeze Box to bring down some Lego pieces, use the ‘WL’ spell on the pieces to create a Quibbler Dispenser. Press the A button to collect a pair of Specrespecs and make your way to the brown pad in front of the gate. Stand on the pad to release the last ‘DLD’ item and place the item in the cauldron. A blue exit platform will appear. (Slytherin Twin #2 Character) – (Free Play Mode) Switch to a ‘Strength’ character (e.g. Hagrid) and pull the lever to the left of the gate; this will open the gate and give you the Slytherin Twin #2 Character token. Now continue via the exit platform. This entry was posted in DS and 3DS, Games, Lego Harry Potter Years 5-7 on February 5, 2012 by Tasha.